Yanghee Lee, the UN Special Rapporteur on the situation of human rights in Myanmar, speaks to the press after visiting the Bangladesh island of Bhashan Char. 25 January 2019. 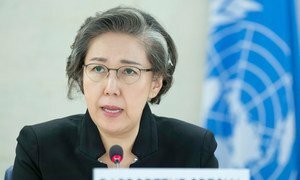 Calling on the Myanmar Government to “immediately reverse its decision not to allow access to all humanitarian organizations”, the United Nations expert on human rights in the South-East Asian country said on Friday, that “it’s vital that assistance is able to reach those who have fled violence in the region”.